our private camp is hidden at the most perfect spot in the futaleufu valley. The confluence of the Azul and the Futaleufu is beauty beyond description. Here we find Campo Tres Monjas home of Eco-Camp on river right, and CondorNest ranch on river left in a grass meadow below the Tres Monjas peak. The Futa Valley hiking trail crosses the Futalefu on a swinging foot bridge giving one a gateway to a web of trekking -hiking, mountain biking and horseback riding trails. "When you think of you have seen it all you arrive at Campo Tres Monjas and the definition of a beautiful setting has to be re-written." " Morning at the Crossing into Campo Tres Monjas"
Eco-Camp at Campo Tres Monjas - The River Camp of River Camps: Ideally located at the perfect put-in and/or take-out for the best runs on the Futa, Campo Tres Monjas is remote and self-contained. All one can see in either direction is a sprinkling of farms, rivers and mountains in this vast countryside. Standing guard over the camp are the three clustered, volcanic spires known as “Las Tres Monjas” (Three Nuns Peak). Campo Tres Monjas is situated in a natural grove of trees and flowering fuchsia bushes. To arrive at this secluded peninsula you must first cross the Rio Azul as it meets the Rio Futaleufu by means of a canoe ferry. Surrounded by nature, this is truly refined camping. "Campo Tres Monjas is a cross between, Fantasy Island, Gilligans island and ClubMed. Chris got the best spot in the valley." Your private provided riverside tent is hidden down a soft foot path. There are two sunny white-sandy beaches with hammocks for relaxing, a dining cabin with sit-down dining, a chef to prepare each meal, a fresh spring water system, open air hot showers, a sauna, a masseuse to soothe your tired muscles, and a bamboo outhouse with a spectacular view.
" This view can be yours. CondorNest is accessed by a winding trail." CondorNest at Campo Tres Monjas. Our private Ranch with a shower in a tree. You have hundreds of acres of private river frontage on the Futaleufu, Las Cruces, and Río Azul. There are play spots, a mild rapid and numerous eddys and pools in the Tres Monjas area. Several miles below begins a rapid known as “Asleep at the Wheel”, and below that there is more world class play. After the “Terminator Wave” the river takes on a huge and extremely powerful nature. Now begins the longest and largest rapid on the Futa, "Terminator" (class 5). The Terminator can be walked and put in just above Kyber Pass" (class 4+).
" Surfing just does not get better than the Terminator wave." The Kyber pass leads into the the giant waves of the "Himalayas" (class 4). How can you surf the two best spots you have ever seen in one day? Beneath the Terminator is Kyber Pass then..."Air Surfing on the Himalayas." We take out at our private river camp Salto de Chucao. 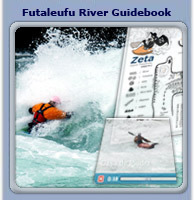 Continue the Secrets of Patagonia tour: Lower Futaleufu River.